If there’s one thing our hotline team members learn from taking calls regarding runaway youth, it’s that each incident doesn’t only affect the youth and their immediate family, but about how a runaway affects a community. In 2016, 17% of NRS’ crisis connections, identified as someone else other than a youth or a youth’s parent. What this means is that we receive calls from friends, other relatives, agencies and even police who are concerned or may be working with a specific youth in crisis. 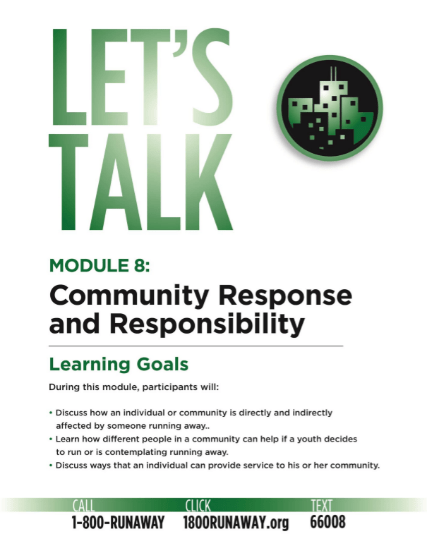 Module 8: Community Response and Responsibility teaches youth how an individual or community can be affected by someone running away. If youth recognize their connections to the community, they hopefully will experience a sense of belonging and a greater sense of responsibility for the community as a whole. It’s important for all of us to recognize how our actions can affect our community in both a positive and negative way. In the first activity, youth have a chance to physically see what our connections look like. They also are shown how a runaway situation might affect those connections. In the activity, youth make their connections using a ball of yarn and learn about a young man named Angel. Angel, a very smart and driven 14-year-old, decides to run from home because of difficulty with his parents and domestic violence in the home. This activity is not meant to bring up whether it was right or wrong for Angel to leave but how his actions affect the others in his life. By talking about how his younger brother, teachers, and friends dealt with his disappearance, it allows youth to think about how their actions might affect others in their lives and communities. It’s also important to learn about those in the community affected by or work directly with youth who run away. Youth will learn more about members of the community such as police officers, judges, school officials, friends, and case workers. These members might be a part of someone’s life and be affected if they leave. How might these people fit into someone’s life? Do they provide support and guidance? Do they interact with youth and a youth’s family? How might they be affected if a youth they know leaves? Lastly, and maybe most importantly, we talk about ways we can all help our communities. Making a positive impact on one’s community is an important lesson for everyone to learn early on in life. This activity is a great way for youth to talk or even draw out ideas for ways they can help their communities. Try connecting with an organization like Habitat for Humanity. Having a clothing drive for a local shelter. Picking up litter along a road. Youth can talk about how they have already made positive impacts on their communities. This is also a great way to start conversations about participating in community service projects. Facilitating this module with a group of youth? It can be helpful to become familiar with your local services for runaway, at-risk youth and families. Contact 1-800-RUNAWAY to get information on local resources in your area.